'Home Alone 2' moves within a familiar framework in order to draw our attention to the ways in which we watch and enjoy it. Its joys, however, have less to do with its variations than they have its repetitions. 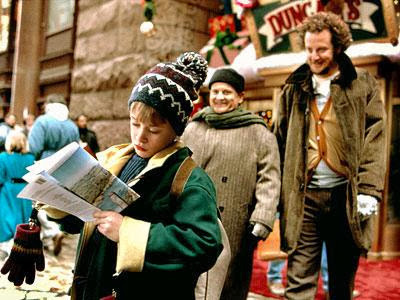 Home Alone 2: Lost in New York turned 20 in November . Written and produced by John Hughes and directed by Chris Columbus, the film wasn’t much of a continuation of its 1990 predecessor, much less an expansion. Rather, it was an unashamed retread: while cast and crew were rinsed, storyline and scenarios were thoroughly repeated. As a five-year-old who laughed hysterically at the sight of two familiar neighbourhood crooks being outwitted (again) by a relatably young lad, I knew no better. Today, I might call it a cynical cash-in. In the first film, the McCallisters, led by Catherine O’Hara and John Heard, botched their family’s Christmas getaway to Paris – a place where Jimmy Stewart’s George Bailey is dubbed into alienating French – leaving youngest son Kevin (Macaulay Culkin) behind in Chicago. Having wished for such freedom in half-jest following an early exile to bed the night before, Kevin enjoyed his newfound liberty before the realities of a daily routine sans family set in; his domestic fears – of the furnace in his basement, for instance – were propelled by the outside threat of Harry (Joe Pesci) and Marv (Daniel Stern), two house burglars nicknamed the “Wet Bandits”. Such forces were faced with ingenuity and courage on Kevin’s part. Elsewhere, we saw a collective strength from his family and a determination from his mother in particular, whose efforts to return home in time for Christmas Day were assisted by John Candy’s impossibly understanding polka band, the Kenosha Kickers. If it seems odd to review one film by synopsising another, that’s because the first two Home Alone films are oddly identical. The opening act of the second film is, to be sure, deliberately indistinguishable from the first, with all kinds of cues re-familiarising the audience with characters, relationships and the inevitable twist to come. Its Manhattan setting thereafter, meanwhile, doubles as a scenic disguise for the fact that seemingly new characters are merely interchangeable with prior incarnations: as the bird lady in Central Park, for instance, Brenda Fricker replaces Roberts Blossom’s Old Man Marley, a snow-shovelling loner who’s rumoured to have murdered his family in the first film but who is, of course, “family” personified. Of course, this is the product of John Hughes’ well-tuned creative energy, which could balance commercial viability with engaging and loveable comedy/drama. Home Alone 2 embodies a conscious adherence to what Mark Cousins called, in The Story of Film, the “schema plus variation” model of art-making. The film acknowledges its own repetitions and re-workings right down to its final shot and line, yelled off-screen in belated acknowledgement of Kevin’s while-the-folks-are-away mischief (here it’s to do with his hotel bill; in the first film it was to do with the mess he’d made of his brother’s room). There are perhaps more obvious variations of schema, though. Unimaginative and clumsy, Marv re-brands his and Harry’s undynamic duo as the “Sticky Bandits”, while the 1930s gangster film that Kevin watches, a sequel to one he viewed in the first film, is simply named Angels with Even Filthier Souls (as opposed to Angels with Filthy Souls). The film-within-a-film might be a sign, here, that the filmmakers want to say something about their own work. In this latter instance, Hughes provides a throwback to the vertically integrated, top-down production line of the old Hollywood by drawing attention to its own working methods, all awhile reminding us that genre is built upon familiarity, and isn’t an inherently bad thing. Indeed, it can actually be profitable, financially but also creatively: much of the humour here is based around our awareness of certain deviations from the first film. Like the first Home Alone, Lost in New York wants and has it both ways: if the first film was able to promote Pepsi even though it makes Fuller (Kieran Culkin) wet the bed, the sequel somehow reinvents New York, that most iconic and clichéd of cine-cities, as a place you’d love to be lost in – the bird lady is lovely and harmless and the menace of the taxi driver who growls at Kevin is only imagined, in the same way that the heater in his home’s basement was. This is, after all, the era of the commercial tie-in: following a possibly concocted audience demand, 1993 saw the release of the Talkboy, a portable cassette player used by Kevin in Home Alone 2 (“credit caaard? You gawt it!”). If there are conservative undercurrents beneath all this, though, it’s at least a stirring way to go about them. For one, Home Alone 2 continues its predecessor’s achievements in acting: Culkin’s overnight rise and consequent rule as the hottest kid on the block is well noted, but as his parents, O’Hara and Heard are as nuanced and believable as filmic spouses get. Pesci and Stern, meanwhile, return for more mayhem, and if there was an underlying sadistic cruelty to the punishments they had meted out upon them in the first film, here there’s a self-reflexive cartoonishness to the climactic chaos. In the first film, Stern got the worst of it, with Christmas tree decorations, kids’ toys and a tarred nail in his foot, not to mention a tarantula crawling across his face. Here, Stern again endures the most unpleasant gags: multiple bricks thrown at his skull (“Harrrrryyyyy….”), a staple-gun to his crotch and, in the most self-conscious treatment of all, a whole wall of paint buckets falling on top of him… after which he’s electrocuted into a multicoloured, screaming, caricature skeleton. Home Alone 2 moves within a familiar framework in order to draw our attention to the ways in which we watch and enjoy it. Its joys, however, have less to do with its variations than they have its repetitions. Some may object to its appreciably darker edge, but doing so is to overlook the violence that often underlines the physical slapstick of the first film. Moreover, Hughes and Columbus emphasise just how cartoonish and daft the second film’s action is – and, by extension, the first film’s too – by having its climax take place in a dusty, abandoned brownstone building shot in otherwise realist shades of murky brown. A far cry from the gorgeous, furnished home in the first film (“this is my house, I have to defend it”), Kevin’s fort in the sequel is conveniently readymade for kids’ play. Cynical cash-in, or clever self-assessment?